Do Our Children Need To Have Their Own Phones? : 13.7: Cosmos And Culture Should kids have cell phones? Cell phones are a powerful technology that have come, very quickly, to assume a very large place in our psychic lives. Should we protect our kids from this? Here's a question, dear reader. I'd like to know what you think. 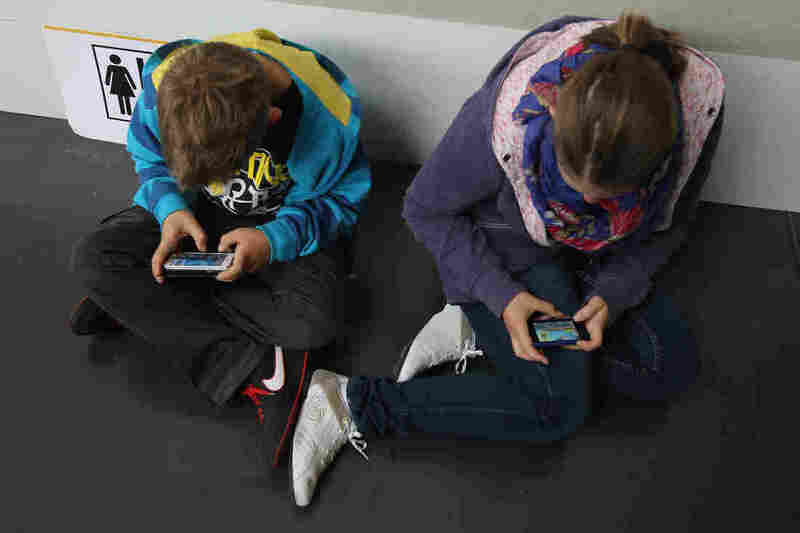 Should kids have cell phones? Just to be exact, should sixth-graders have cell phones? Should I get my son a cell phone? He's modest in his demands. He says he'll settle for an iPhone 4. It's not like he wants the latest model. I am serious. What should I do? I didn't need one when I was his age. They didn't exist then. Has the world reorganized itself so that a kid his age really does need a phone? When I was a kid I always had a dime in case I needed to reach my parents. Both my parents worked, and I knew where they worked, and I could pretty much count on reaching them. I don't remember actually ever calling my parents. But I do remember the dime. Well, there are no phone booths any more, at least not where I live. So that's a reason in favor. A part of me loves the idea that he would have a phone. After all, as somebody once said, mobile phones are basically tracking devices with a few add-on features. And I love the idea that my son, in exchange for his phone privileges, would have to check in with me and keep me apprised of his movements. And then there's the fact that I'm separated from his mother. A phone would give me access to him, directly, without having to go through his mother. Would that be good for him? Or me? I am his father, after all. I'm sure it never occurred to my parents to want to check up on me or have me check in on them. Their idea was: if we don't hear anything, things must be OK. Was that a good policy? I don't know. But it is a striking fact that I don't know any parents who have that policy today. I think it was pretty common when I was a kid. OK, enough about me. Here's the serious point: cell phones are powerful. I don't know anybody, at least not anybody grown up, who lived through the great transition brought on by the technology's arrival who doesn't have a love/hate relationship with the phone. The device is always with us, always beckoning, always tempting us to give in to whatever kind of urge it is that makes us check text, phone, Twitter, Facebook, email how many times an hour? As long-time readers of this blog know, I am something of a skeptic about addiction-talk. But it seems like a good case can be made that we are addicted to our mobile devices. They obsess us. They interfere with our engagement with the world around us. They afford us pleasure, but also anxiety — they never let us rest! Whether they are addictive or not, I think it is safe to say that for many of us they are problematic. We check our cell phones with compulsion, much as we might feel compelled to steal a glimpse at our reflection in the glass as we walk by. I don't claim to understand the curious cocktail of vanity, urgency, curiosity, pleasure and anxiety that cell phones seem to serve up. What I know is that it makes me nervous to think I should be serving that up to my son! Isn't that like buying your son his first smoke? And isn't that sort of gross? And isn't he too young anyway?